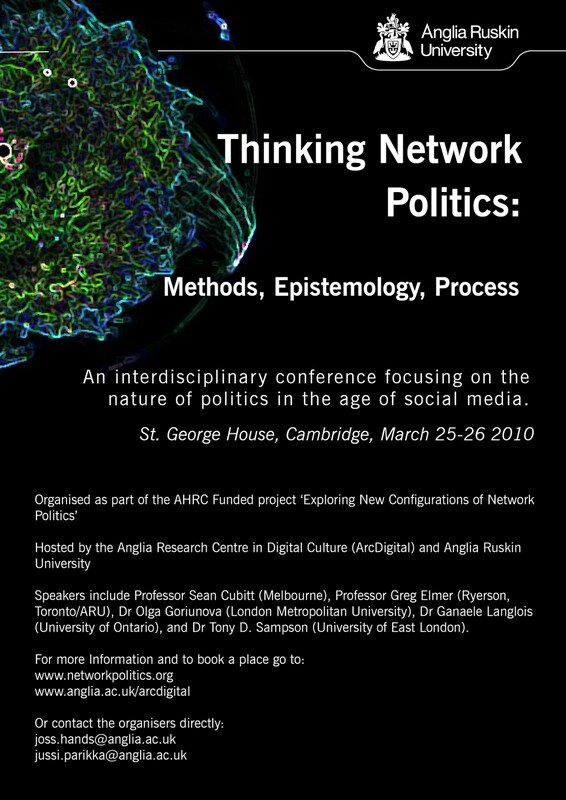 >Here is the poster for our forthcoming Network-politics event, full title: Thinking Network Politics: Methods, Epistemology, Process. Its the first in series for the AHRC funded project, followed up by next one in Toronto around end of October and the final one in Cambridge, next year. This promises to be an exciting event, where most of the emphasis is on emerging discussions instead of “only” academic talks; the length of talks is reduced to give time to what follows from the position papers that touch media arts and artistic methods, activism, network ontology and methodology, media archaeology, clouds and love. A whole range of themes, indeed. >thanks, very on par with the theme of the project! >Mapping Maternity performance >Does Software have Affects, or, What Can a Digital Body of Code Do?